1. 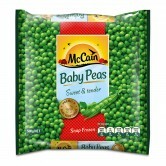 In a glass serving bowl layer lettuce, grated carrot, diced yellow capsicum, McCain Baby Peas, diced tomatoes, shredded red cabbage and McCain Corn Kernels. 2. To make the dressing, mix sour cream, mayonnaise, lemon juice and Dijon mustard in a bowl, season with salt and pepper, to taste. 3. Top the salad with the dressing and spread to the edges to seal. Top with quartered eggs and garnish with spring onion. Serve immediately or cover with cling wrap and refrigerate overnight. 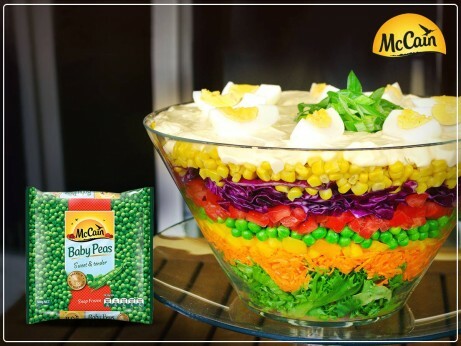 1 In a glass serving bowl layer lettuce, grated carrot, diced yellow capsicum, McCain Baby Peas, diced tomatoes, shredded red cabbage and McCain Corn Kernels. 2 To make the dressing, mix sour cream, mayonnaise, lemon juice and Dijon mustard in a bowl, season with salt and pepper, to taste. 3 Top the salad with the dressing and spread to the edges to seal. Top with quartered eggs and garnish with spring onion. Serve immediately or cover with cling wrap and refrigerate overnight.